Good: Very atmospheric, very tense. Bad: voice acting isn't always that convincing. 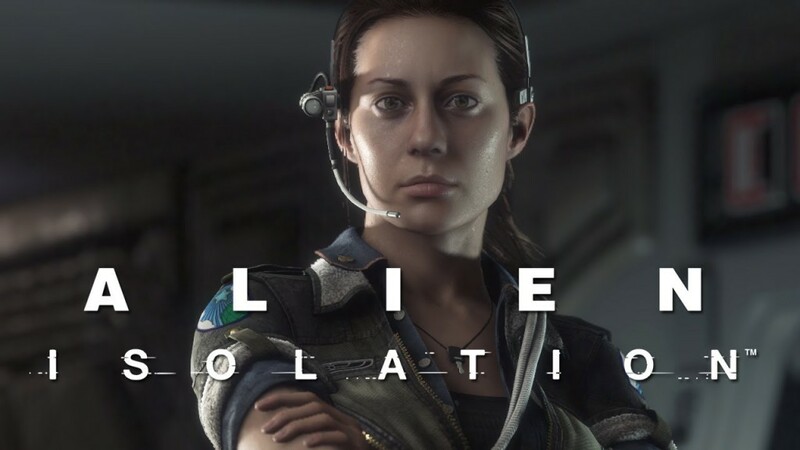 After the less than stellar release and subsequent bad reception of the both gamers and game reviewers, Sega has given Alien another shot, but have taken a complete other take on the gameplay and story. If you are hoping for a gun slinging action packed balistics test with aliens as target practice, then you’ll be sadly dissapointed. 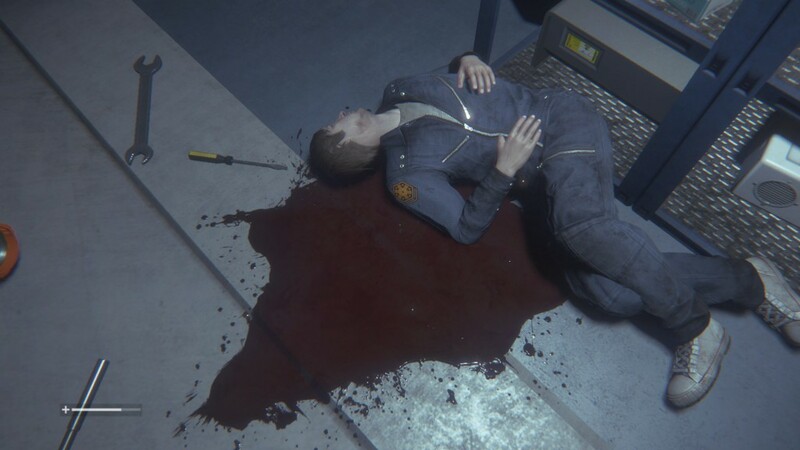 Alien Isolation is all about stealth and survival. You are Amanda Ripley, the daughter of Ellen Ripley. You are completely at a loss at what happened to your mother and upon hearing the news that they’ve information on her whereabouts, you are drafted to be part of the search team. When you reach Sevastopol, the place where the flight recorder of the Nostromo is located, the damage is more than evident. Something happened, and you and your team go in to investigate. Before you even get to set foot on the Sevastopol things go south, and you alone make it to the air lock. Investigating the place shows that everything is in dissaray. It only gets worse from there on out. The game is beautiful. Everything is so polished and shiny, well the parts that haven’t been destroyed. The animations of the characters are done really well. There were some glitches, like a gun floating after the wielder had died or sudden movement mid conversation. The game does a nice throwback to its roots. The computer screens are green and look completely outdated and the screen happily bleeping to life as you urgently need the air filtering to cease fuctioning. The androids left behind to secure the station have turned hostile. However when you look at them they look so lifelike, so calm. There is no panic in their movement when they see you, no sudden scramble for you, they just come at you with a proud stride, easily flicking away your attempts to bash in their brains. They just don’t care. This adds to the surreal atmosphere of their survival instinct. The alien moves so gracefully, so serene. Like it’s tiptoeing just to entrance you. Sound is extremely important in Alien Isolation. It’s the lifeblood that pulses through it and gives away details. Why is this so important? You can’t always see the enemy, so you have to make sure you are paying attention to your surroundings. When you are hiding, you can’t always peek out, in case the enemy is too close for comfort. So you have to listen to everything. The panicked voices of the survivors looking for you, ready to pull the trigger. The androids whose voices are soft and silken, the embodiment of calm. Equally lethal in their intent. The thumping overhead. The alien in the vents ready to take you out or just some noise? The hissing in your ears, just the vents regulating the air supply, or the something more lethal? This is what makes the game so tense. You’ll be wondering what the source is of the sounds and this gives Alien Isolation its immersion. But not all voice acting is done equally well, when exploring the Nostromo, you’ll come across recordings. These can range from personal messages of a man to his wife, or of a less personal relation, like a boss to his employee. The recordings flesh out the narrative of the game, but some of them sound lifeless, without urgency. Alien Isolation is all about stealth and survival. 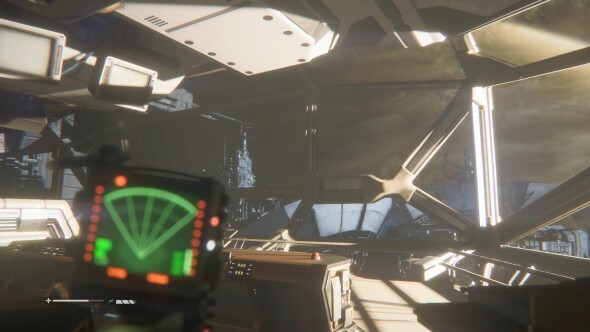 When you set foot upon the Nostromo you’ll get different objectives as the story progresses. The game has a lot of backtracking. Get to point A, extract information/get item, go back to the elevator, but this time everyone on the ship is alerted to your existence. So you’ll have to make sure to make your way undetected, crawling through vents and hiding behind boxes. That being said you aren’t completely defenseless. The environment is your ally when you want to hide. Surivors aren’t always nice and if they can they’ll rather shoot first and ask questions later. Humans aren’t the only threat. There’s artificial intelligence on board in the form of androids. Where they were made to help those who are manning the station, they’ve now become rather hostile and will patrol the hallways. When an android is blocking your path forward, look around for a vent or a room where you can crouch and hide, making sure not to cross its line of sight. Did it spot you? Break the line of sight and hide. Closets, cupboards, vents, even ducking under a desk is an option. Just make sure they didn’t see you get under there. Should you ever run into a dead end and you’re stuck between a rock and a hard place, then it isn’t always the end. 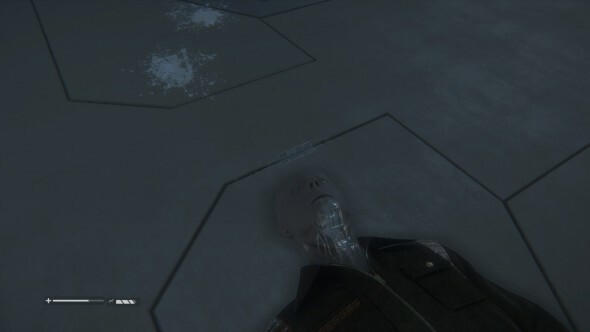 The androids have a rather sadistic streak, and they’ll try and choke the life out of you. A button prompt will emerge which gives you the chance to overpower them and make another bid for survival. Sneaking up on one of the manlike machines can help you bash away at it, this doesn’t work when they are aware of you. They’ll just flick away the attempt like it’s nothing and you’ll be knocked back. The game might all be about stealth and the protagonist isn’t known for her military upbringing, but she can handle herself. As you progress in the story mode you’ll pick up weapons and blueprints to help you turn the situation in your favor. A handgun, a shotgun and a flamethrower will be added to your arsenal and you’ll pick up blueprints for things like distractors and emp grenades. The Nostromo is littered with items to craft anything you might need. There’s scrap lying around, injectors, components… With weaponry in your possession, you might think the game gives up its stealth and goes for a run and gun method. Think twice though, it’s just another option and not an entirely viable one. Using guns is loud and it’ll soon attract unwanted attention. Add the limited ammunition, spraying and praying won’t do you any good. Because even if you are to come out the situation with a pulse, you’ll soon have another aggressor on your tail. This one isn’t phased by bullets and will only shy away from fire. Even though you might scare it off, you still have to makes sure you get away before it tries again.So you’ll have to try and overcome situations by avoiding detection. You crouch and you move from cover to cover, carefully scanning the environment for potential hazards. In the first hour of the game you’ll be on your own, and you’ll have no way of telling where the danger will come from. A little later you’ll come across a detector. Use this to tell you the proximity of everything that moves. Human, android and alien alike. It’s also never wrong, when the hallways are empty and you see a blip really close to you, the alien is in the vents above or next to you. This doesn’t always mean it will attack, but just make sure not to run as noise attracts it. The alien encounters are mostly unscripted. Survival horror can already be pulse pounding when you can predict, or try to predict when an enemy might emerge. Not knowing or having the possibility to have it pounce you at any given moment adds another level of suspense. Any moment could be your last. The game has a secondary mode apart from the story campaign, which is quite long to finish. Once you’ve done this, you can take on the survivor missions, it’s possible to do them before hand but doing so will spoil your story mode, so the game advises against it. In this mode you’ll have a series of objectives, and you’ll have to complete them to get points. Completing the main objective will give you points, but finishing the side goals will add to this total. Try for all side goals and finish the mission to get your name plastered on the leaderboard. Alien Isolation has taken survival horror to the next level. This is the game alien fans were waiting for. The claustrophobic feel of it and the constant fear make for a terrifying experience. Alien Colonial Marines was an artificial intellegence nightmare, enemies were dumb as bricks and their behaviour wasn’t at all organic, mostly due to the bugs and glitches. 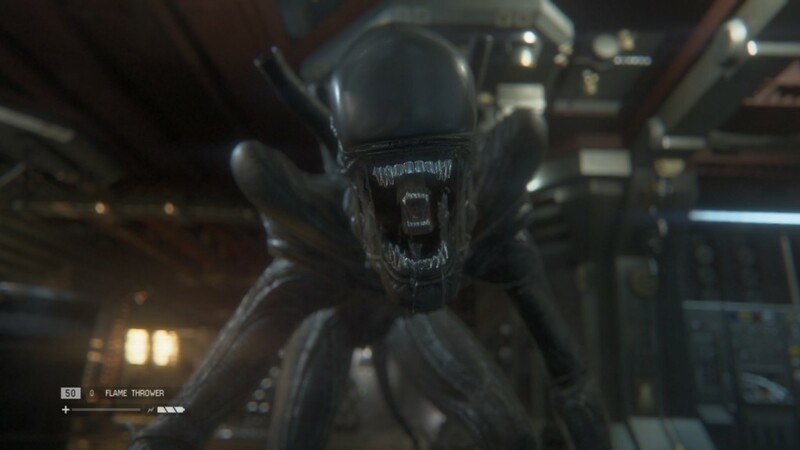 Alien Isolation has enemies that will react accordingly and to their abilities. This causes you to be tactical about your approach and your behaviour. You aren’t unarmed but that doesn’t mean you are all powerful. If you are looking for something to put you on the edge of your seat with claustrophobic terror and stealth is your thing then step right up. More information on the game here.